I've decided to join the cause. But first of all, I'd like to introduce the newest addition to the MyDogsLove.Me "pirated" pack. Meet Miga. "Miga" means girlfriend in our dialect. 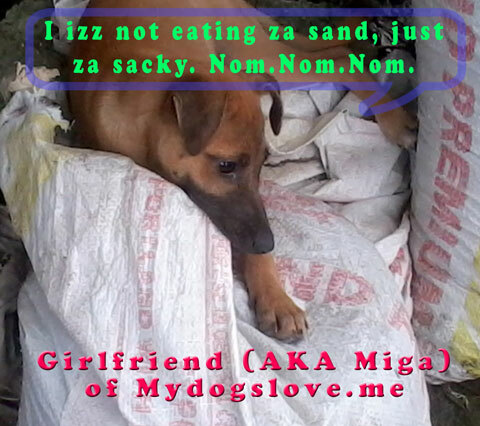 Miga is actually our neighbor's dog, but she visits us everyday. At first I'd thought she was just in heat and the purpose of her visitation was just to check our alpha out. But a couple of days ago, she'd solely expressed her interest in the humans of the house. Unfortunately, I haven't seen her these past 2 days but I've noticed her injury one time she came here. I don't know what had happened, but I'm pretty sure she was the one I heard screaming some days ago. I've been enticing her to live with us like how BD (aka Brother Dog) came to staying here for good, but that's another story. Oh my goodness, I hope she's okay! She's fine. I'm just too worried because she has a bad leg and that she's not our dog, so we couldn't intervene. How's Rocket? I was worried about how he was doing with the bad leg.